TeHyBug the ultimate spy-bug for your home, it measures the temperature and pressure periodically and sends the infos to a data-webserver. The box has enough space for a TeHyBug and one 9v or one 18650 Battery. Please note, you'll have to drill some ventilation holes in the box, so your TeHyBug can measure the environmental data correctly. Which environmental data it measures? Which sensor type it uses? Which data serving options are available? Serving data as a Web-Server on port 80 in form of HTML code or json format. Showing the environmental data on an OLED display. 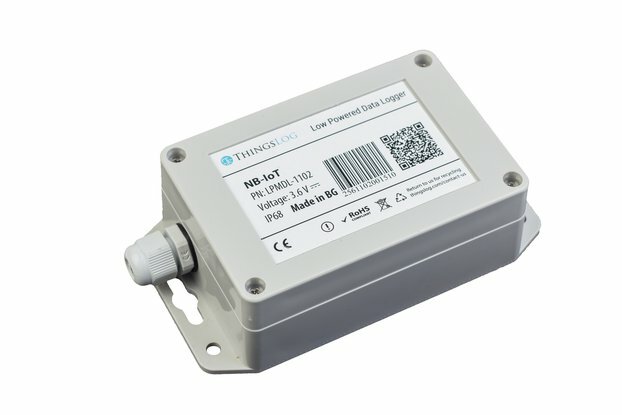 Receive alerts with sensor to your mobile phone or via email. TeHyBug (Temperature Humidity Spy Bug) is an ultimate low power environmental data spy-bug for your home. 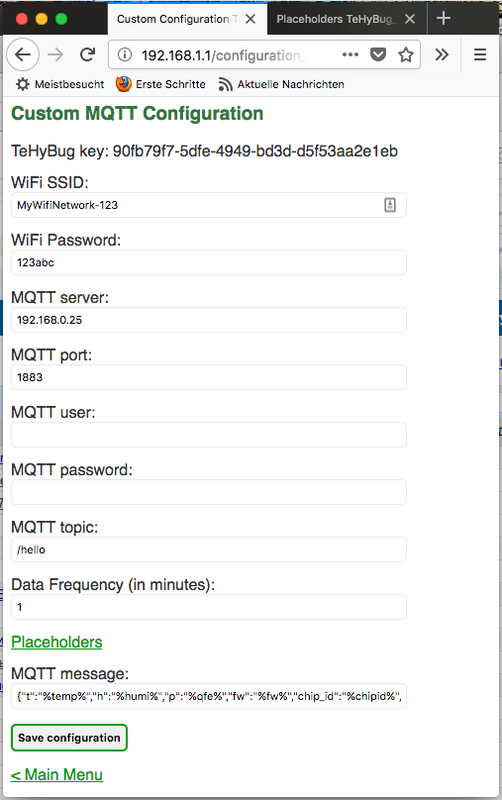 It logs an environmental data periodically and sends it to the TeHyBug-Server, your own web server or MQTT broker like a Raspberry Pi, where you can view the data in a nice daily/hourly graph. Measure the environmental data in your private server room, basement, storeroom, library etc.. Create your own weather-station. Put it at any place where your wifi network is available. The battery lasts for several months! 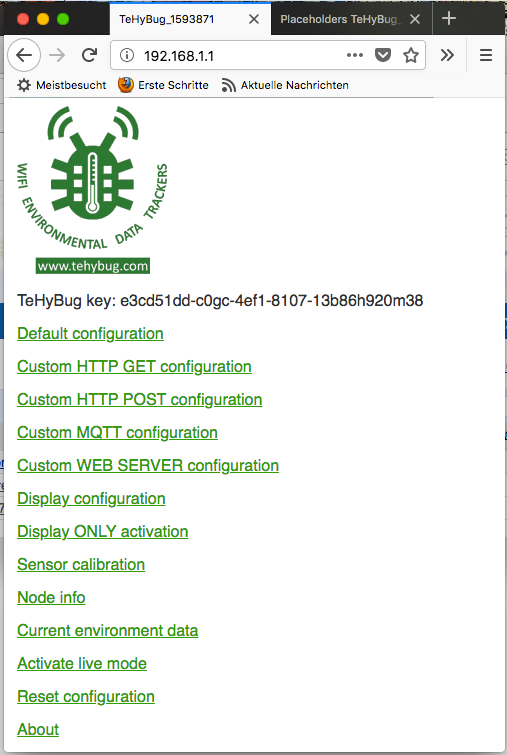 In our testing environment, the TeHy-Bug with DHT22 sensor is collecting data for more than a half year. It uses a single 3,7 Volt 18650 LiPo-Cell (depends on sending data frequency and battery type). A soldered, ready to use TeHyBug, with modified ESP8266 ESP-01 module (modification enables the deep sleep mode for power saving). The module includes pre-flashed and preinstalled environmental data logging software. How to start data logging with it? 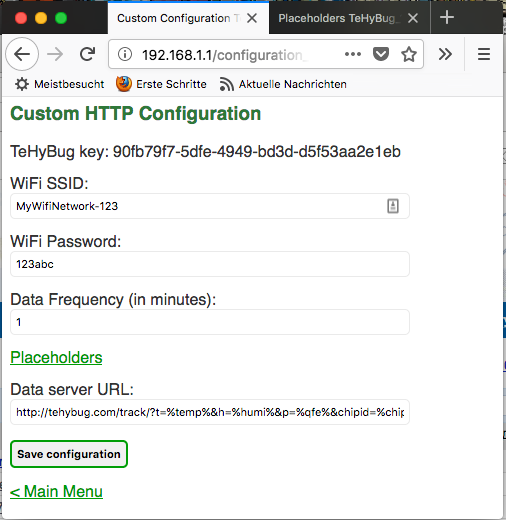 Before going live with environmental data measurement, you'll have to connect your TeHyBug with a browser to set up a http url of the data web server, and provide your wifi network credentials for internet connection. The module requires a 3.4 to 11 Volt input voltage. It also requires a connection to a wifi network to send the sensor data. How to configure the device? or use Blynk, thingspeak or Domoticz home automation system for logging and displaying data. You don't need to program the ESP8266 module, you'll receive a TeHyBug with already uploaded code to it. You don't need to flash the ESP8266 module, you'll receive a TeHyBug with already flashed ESP8266 module. You don't need to code a data-logging script, I have developed a tehybug.com site which will displays the data graph. 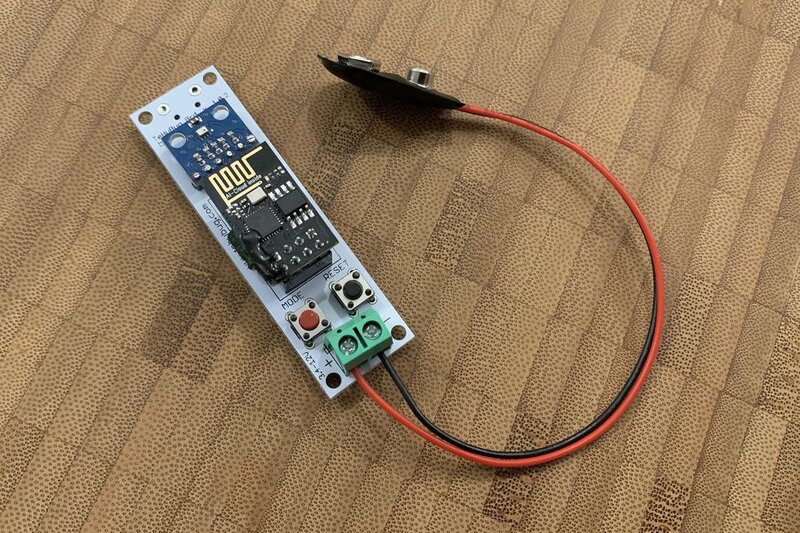 You don't need to modify the ESP8266 module for power saving, you'll get already modified module. All you need is to configure your wifi credentials as described on above. How to improve TeHyBug's battery life and increase its battery operation time? The battery life depends on the data-frequency you set for your TeHyBug. 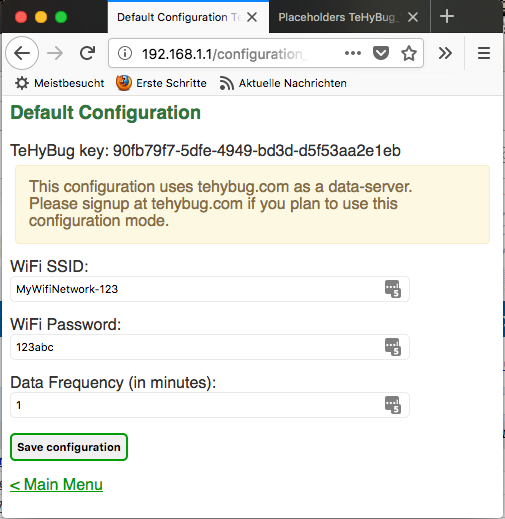 The TeHyBug consumes most of power during the data measurement and wifi connection, once wifi connection is established and the sensor data is sent to the data-server, the ESP8266 chip goes into a power saving deep-sleep mode. In battery powered mode the data-frequency should be set to 30 minutes or more. 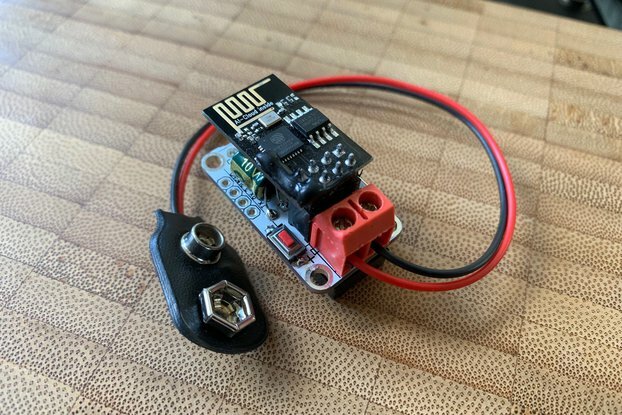 It also depends on the battery type that you use, by default you receive a TeHyBug with a 9v battery connector, so you can easily use it with a 9v battery. The 9v batteries have a low Ampere-hour capacity so its recommended to keep the data-frequency high. TeHyBug supports different batteries from 3.4V to maximum 11V, so you can use other batteries with it too. In case, you want it to measure the data very often (i.e. every 5 minutes or less), it is recommended to use a power supply, for example a usb power supply for your TeHyBug. The higher you set the data-frequency, the longer your TeHyBug will operate in a battery powered mode. The more Ah the battery has, the longer your TeHyBug will operate in a battery powered mode. TeHyBug s6 with BME680 air quality, temperature, humidity and barometric pressure sensor. TeHyBug s5 with BME280 temperature, humidity and barometric pressure sensor. TeHyBug s4 with waterproof DS18B20 temperature sensor. TeHyBug s3 with BMP280 temperature and barometric pressure sensor. TeHyBug s2 with DHT21 temperature and humidity sensor with long wires and protective case which can be placed outdoors. TeHyBug s1 with DHT22 high precision temperature and humidity sensor. Nice compact temperature & pressure monitors. I intend to have one in my cottage and the other in a protected area in the garage to monitor temps this winter.